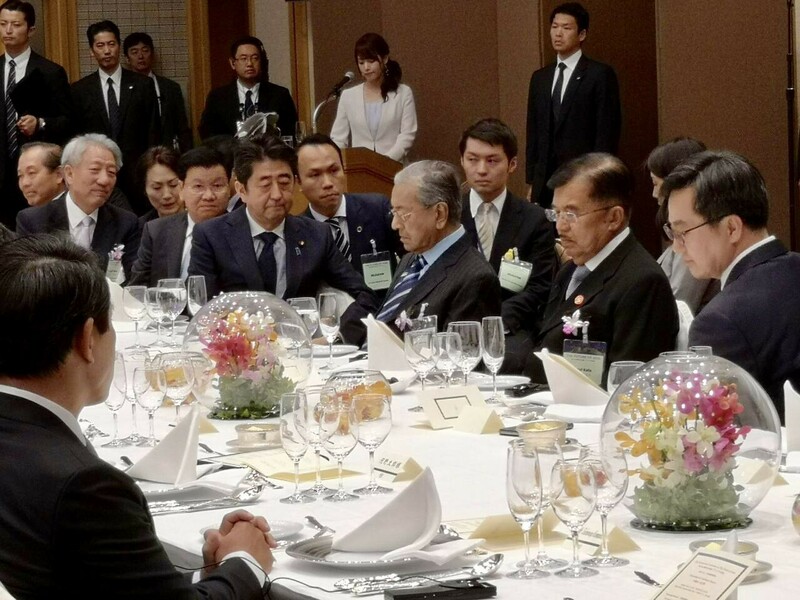 Tun Mahathir attending dinner of the 24th International Conference on the Future of Asia hosted by the Prime Minister of Japan, H.E. Mr. Shinzo Abe today. Tokyo, Japan: Prime Minister Tun Dr. Mahathir Mohamad has expressed his concern to form a second national car company after Proton sold 49.9% of its stake to China’s Geely Automobile Holdings. Dr. Mahathir said Proton is no more Malaysia’s national car as it has sold its share to the Chinese company. “The project will also include the ASEAN and other counterparts to produce cars that could be sold to the global market,” Dr. Mahathir said at the 24th International Conference on the Future of Asia or Nikkei Conference here today. Dr. Mahathir also said that Malaysia will consider reviving the East Asia Economic Caucus (EAEC) that was opposed by the United States of America (USA) and Australia in 1997. “We are not against the Trans-Pacific Partnership Agreement (TPPA) but in favour of EAEC. The formation of EAEC will give smaller countries a chance to compete as they were given handicaps and thus have a serious economic impact on them. “EAEC will include India, some Central Asian countries apart from ASEAN, Japan, China and Republic of Korea,” he added. Dr. Mahathir said, in the past USA imposed regulations that either country joins international bodies or have to pay high prices.